A look at the Mlle Lenormand Moon card. There are but a few cards that I have to stop and think about how they fit into the layout. Normally, I do blocks of cards that center around specific themes but sometimes there is an “odd” card that somehow doesn’t fit in right away. I find that with the Moon card on occasion. Knowing that the moon has different phases, the suggestion would be that the “theme” under inspection is going through such a phase. A lunar cycle can be involved hinting at a time frame for manifestation. The moon has been associated with the deep roots of the PAST. A close connection to the Tarot High Priestess as well as the Tarot Moon cards. 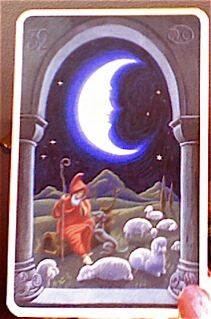 In some cases the #32 is a contributing influence to the other cards meanings so that clarity may be hidden. Some readers of the Lenormand use the traditional suggested meanings of honor and a type of recognition. I think this is valid when the person getting the reading (or oneself) is in a position where that is a possibility. The shadow meaning of the Moon card should be considered as well because when connected to the less promising cards the indication will be temporarily negative as well. Emotions come under the rulership of the Moon card. The ebb and flow of feelings as with the tides on Earth. The Sun will intensify and strengthen the positive whereas the Clouds will increase the opposite. When the Moon card doesn’t blend well with most of the other cards -I take it to mean one’s belief system of the moment which may or may not be distorted.